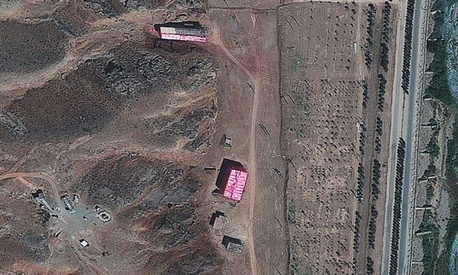 Israel and Iran have been sparring over Iran's nuclear development for months, but, after news leaked the U.S has been quietly trying to diffuse any potential of an attack, a warning was issued that U.S. bases might be included in the retaliation should anything happen. Israel's been debating a strike against Iran's controversial nuclear facilities for weeks. Ban Ki-Moon announced he was attending the Nonaligned Summit in Iran last week despite rumors of an impending Israeli strike against Iran's nuclear facilities. On Monday morning, the New York Times reported that the U.S. have publicly and privately been making small moves to try and prevent and Israeli strike against Iran, while also trying to discourage Iran from furthering their nuclear program. Israel's Prime Minister Benjamin Netanyahu said recently that Iran must see "a clear red line and such determination," otherwise "it will not stop the progress of its nuclear project." But now Reuters reports a Hezbollah representative said if Israel does make the decision to attack Iran's nuclear facilities, then American bases in the area would be included in the responding strikes. "A decision has been taken to respond and the response will be very great," Sayyed Hassan Nasrallah, the leader of the Iranian-backed Hezbollah in Lebanon, told a Beirut-based television station. "The response will not be just inside the Israeli entity - American bases in the whole region could be Iranian targets," he said. "If Israel targets Iran, America bears responsibility."